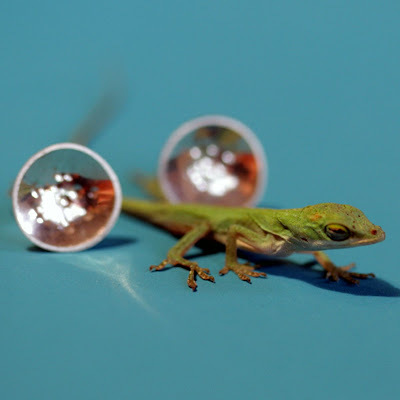 My husband checked the lizard egg that he has been watching and noticed that it hatched. We couldn't resist taking pictures of this little thing! 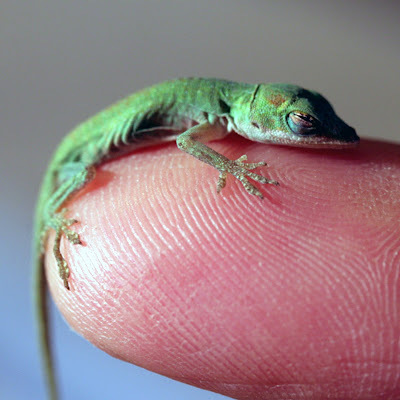 This is newly hatched anole lizard, which are a type chameleon that are common in the southeastern coastal area. They grow to be about 3-4 inches long and have beautiful color. this one fit on top of your fingertip! When angry or threatened they turn browish black. When happy they are a lovely shade of green. During mating season the males blow up the bottom of their throat, which is a bright red color used to attract females. They can "drop" their tales when threatened to escape an enemy. My cat still terrorizes these pretty little lizards. Aw, it is so sweet. They are around here, but more so in Houston where I grew up. They remind me of my PawPaw. I love them, but I'm still a bit nervous about touching them. 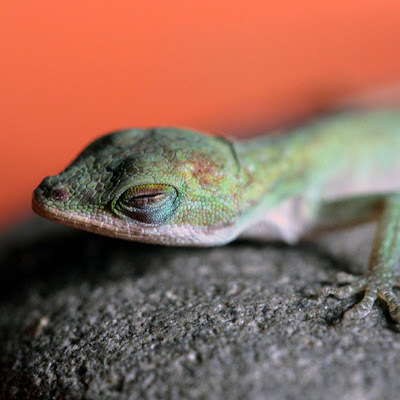 Anoles are not chameleons. People often confuse this fact due to their ability to change color from green to brown. They are closer related to iguanas.